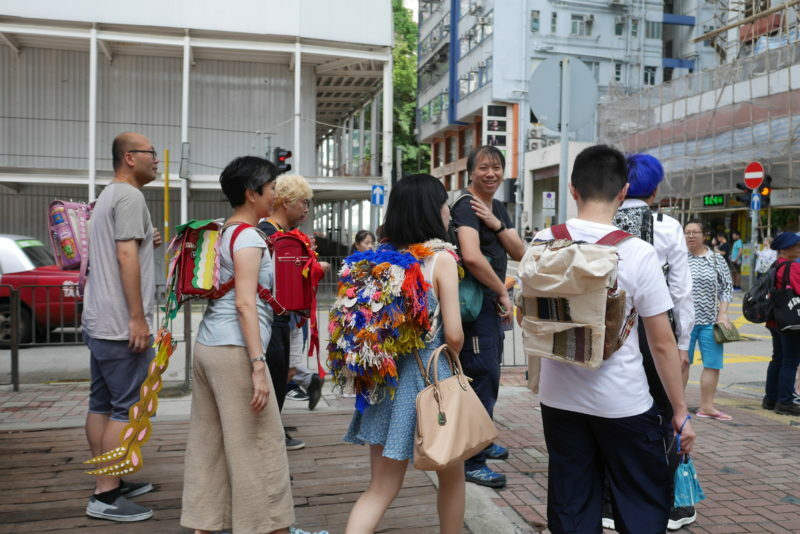 On our first ‘tour’ around Causeway Bay Wet Market, we had around 10 volunteers, each who chose two of their favorite backpacks that was durable. It was very exciting because we all got to see the backpacks for the first time. We started by unpacking the backpacks from the boxes used to ship them across. This felt very special because it felt like we were the receiving end of a ongoing conversation. It was a delight to discover the little gems within the backpacks created by different artists across Asia. As we looked through the backpacks, it felt like we were having a conversation with the artists through their alterations of the backpacks. Some revealed personal experiences, some shared traditions from their culture. Once we all hand picked two of our favorite backpacks (one for the public to try on and one for ourselves) we made our way to the Causeway Bay Wet Market. As we walked over, we received a lot of side glares, mainly because we were taking up so much street space. It didn’t seem like people were interested in why we were carrying around these backpacks, but more irritated that we were blocking their way. (this was my personal speculation) Then when we got to the wet market, we walked around the market and attempted to initiate conversations with shop owners and customers. To my disappointment, almost no one was interested in having a conversation about the backpacks. They were busy working. While the lack of response was expected from Hong Kongers, I still felt rejected. Then we attempted the area around the market. There weren’t many people around the area but we spread out and attempted to interact with as many people as possible. We stopped people who were passing through and stopped to talk to shop owners along the way. However, not many people responded to us. Many gave us nod and a smile but only a few stopped to hear us out. As a group of 10, who were each carrying decorated backpacks, it felt like we were trying to sell something. I think people in Hong Kong are hesitant to stop because often times people on the street are trying to sell something to you. Additionally, the streets are very narrow and the lifestyle here is very fast pace so people tend to always be rushing to their next appointment. Hence, the reluctance to stop. The busy and crowded streets makes it difficult to start conversations with people around the street, especially conversations about art.